A typical weekday morning involves me making a mad dash to get ready and out the door in time. I typically try to squeeze in a morning run, pushing my timeframe and running out the door with barely my hair fixed and DEFINITELY nothing ironed and praying that I thought ahead the night before to pack something for breakfast to eat on the road or in the office. Most people suffer from the dash and go morning routine. Whether it is because you try to cram a morning workout in or get your kids ready or are just hitting that snoozypooze buttom one too many times, a healthy breakfast is likely the last on your list. I find that if I don’t eat a good solid, protein rich breakfast, the rest of my day has me STARVING AND EATING MY ARMS. Try going the rest of your day with only bloody nubs….not good. Gross, I know. I used to toast whole grain bread and slather almond butter on it for a quick breakfast, but lately I’ve been trying to eliminate gluten and grains from my diet. Finding quick make-ahead gluten and grain free breakfast alternatives has been the hardest challenge. Until now…. 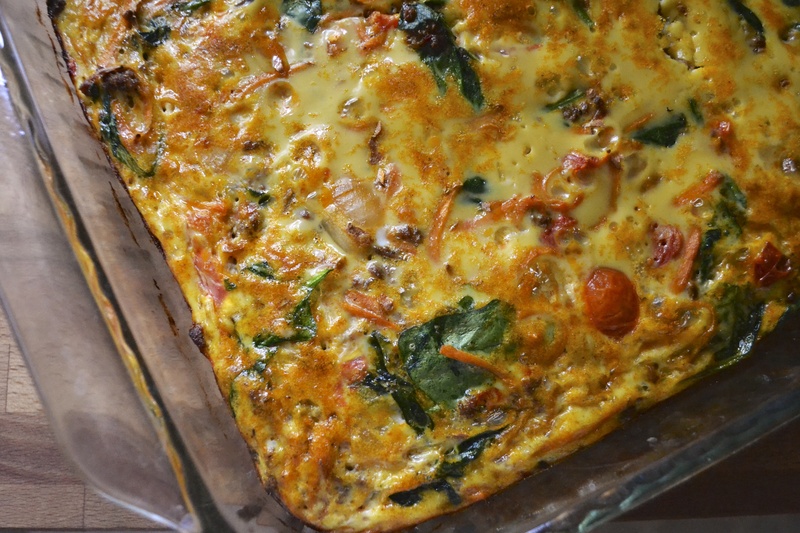 (2) the casserole can be baked ahead of time and the leftovers taste just as delish as if it were fresh baked. Whip one of these casseroles up on a Sunday evening…go ahead, eat B for D (breakfast for dinner)… and then eat the leftovers for breakfast throughout the week. Brilliant! This gluten-free casserole serves a crowd (10 at least) or it can feed 2 peeps for a full week. It is also a great way to use up excess ground beef! This recipe is really just a building block. Any meat or veggies could be interchanged. I shredded a sweet potato as the starch. But if you have picky eaters in your house and they are not down with the sweet potato, then go tell them to make their own breakfast…OR you could be nice and use a shredded potato instead. This casserole is not too spicy but could be amped up by adding an additional jalapeño and chili powder, or using chorizo sausage instead of the ground beef. *Note – if you have picky eaters in your house, you can substitute regular potatoes for the sweet potato. And if you are _really_ in a pinch, you can substitute frozen hashbrowns. Preheat oven to 375 F. Spray a 9″X13″ baking dish with nonstick spray and set aside. Shred sweet potato using a food processor with shredding attachment or by hand. Set aside. Cook ground beef in a large skillet over medium-high heat until no pink remains. Break into crumbly pieces using a spatula. Drain off extra grease. Add onion, shredded sweet potato, garlic, jalapeño, chili powder, salt, and paprika into skillet. Cook until onions are translucent (about 5 to 7 minutes). 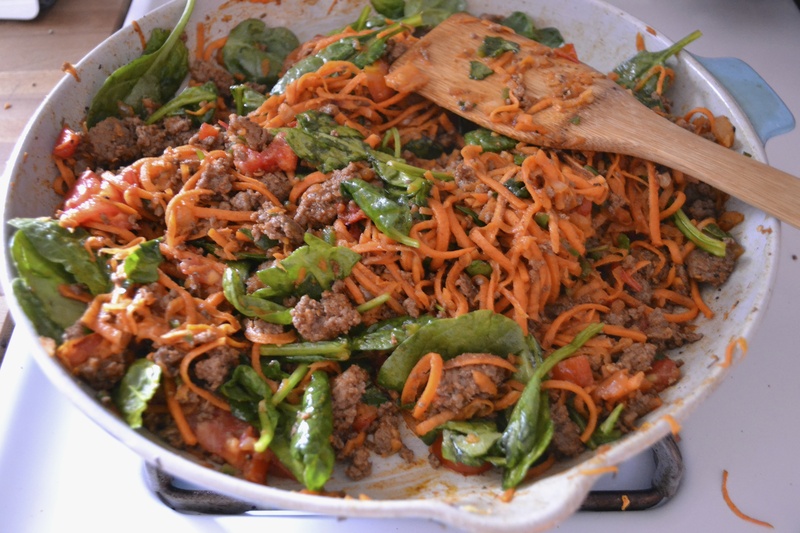 Add tomatoes and spinach into skillet and cook for about 2 minutes or until spinach begins to wilt. Place in preheated oven and bake for 30 to 40 minutes or until middle of casserole is set (not jiggly) and edges are lightly browned. Remove from oven and allow to cool for 5 minutes. Feeds a crowd of 8 to 10 or it feeds 2 people over the course of a week!!!! This is great – my family would love this! AmericanHealthJournal is looking for partners in the medical field. American Health Journal is a medicine site which contains three thousand of high quality health videos. We are seeking individuals who are interested in contributing guest articles to our web site. Please message us at our contact form on our site. I made this for dinner tonight only subbing ground turkey sausage for the beef. So delish! Thank you for much for the recipe! Yum!!! What a great dinner. Glad you liked it. Think I could substitute plantains for the sweet potatoes? I don’t know. I have never cooked with plantains. If you try it, let me know how it goes. I think Butternut squash would be a good substitute too. Great idea for easy substitution. I’m so glad everyone loved it. I’m wondering about why you didn’t peel the sweet potatoes? Also, if you want it to be paleo-compliant, subbing white potatoes would be iffy. If you did use white potatoes, they would need to be peeled. I don’t peel my sweet potatoes because there are a lot of nutrients in the peel, plus it’s faster. That is true about white potatoes. However I mentioned them in this recipe only because some families have picky eaters that don’t care for sweet potatoes. I am going to be traveling and wanted to make this the night before, but serve it for breakfast the next morning… so technically it would be been made a day and a half before. Will that be OK? Oh ya! It’ll be perfect. I made it and ate on it for a week straight. Delicious everyday. I also used ground turkey, and an 8oz bag of spinach. So that’s maybe more than 2 cups. Put in a can of diced tomatoes with cilantro and lime. Regardless, everyone loved it! GF, Paleo, it’s all good. We topped it with habenero salsa and sour cream. Delish! My family loved it! Made it for Thanksgiving morning, now making it for Christmas morning. Yay! Thats great. Perfect for christmas! I have made this several times and just love it. In fact, everyone loves it and always asks for the recipe. However, I’m wondering if this could be made without meat? I would love to make this and freeze it into portions as a grab-and-go breakfast for my daughter. Would I need to change anything in the recipe if i leave out the meat? Could i sub a few cups of veggies for the meat? Thanks for your thoughts. I definitely think this could be made meatless. You could add one cup of diced bell peppers to supplement. Delicious. I added bell pepper and used ground chicken in place of beef, just because that’s what I had. I only used 9 eggs because that was also all I had. My egg-hating daughter had seconds, as did my egg-loving daughter. Husband thought he wouldn’t like it but did. I think we were all surprised that a dish like this could be so tasty without the cheese. Thank you very much for posting it! Oh…to save a dish, I also just baked the casserole like a frittata, in the same enamel cast-iron skillet I’d cooked everything. Great idea!!! Thanks for the lovely feedback, Christine. how is this called dairy free, yet made with eggs? Hi Mary, Eggs aren’t a dairy product. 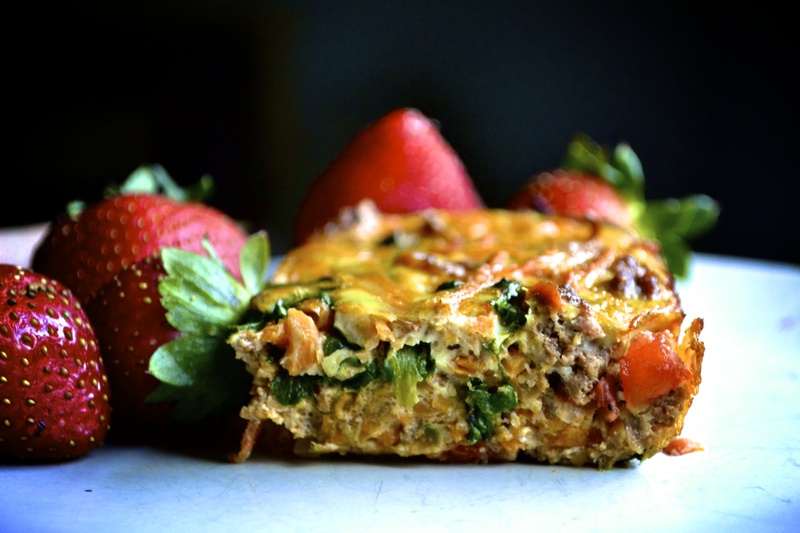 This casserole is dairy free because it does not contain any milk-based products. Hi! If I made this casserole using butternut squash instead of potatoes, how would go about that? Thank you for your help. I’m looking forward to trying it but I’m on SCD for health reasons and can’t do potatoes. I think substituting butternut squash for the sweet potatoes would be very tasty and work well. You should be able to do use the butternut squash in the same manner as the sweet potatoes. Good luck and let me know how it goes! Crazy question — do you bake the sweet potato first? I’ve made this dish where I’ve sautéed the shredded sweet potato first and also where I have not precooked it. It works both ways.